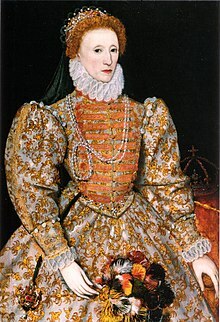 Elizabeth I (cried "Elizabeth" until Elizabeth II teuk the Breetish throne; 7 September 1533 – 24 Mairch 1603) wis Queen o Ingland an Queen o Ireland frae 17 November 1558 till her strae-daith. Elizabeth wis the fift an pokeshakkins o the ryal Hoose o Tudor. The dochter o Henry VIII, she wis born a princess, but her mither, Anne Boleyn, wis executit three year efter her birth. Wikimedia Commons haes media relatit tae Elizabeth I of England.